The other incident is recorded in Genesis 28:20-22 where Jacob made a vow or promise to give God a tenth of all he has if God will be with him and watch over him on this journey. I have not heard anyone teach that Christians should give God a tithe only if various things work out right. By the way, I also believe it is right not to teach that. God had just given Jacob a promise in a dream which was the basically the same promise he had given to his father Abram – with no strings attached. (Gen 28:10-20) On his own, Jacob decided to add something to what God had already promised. God did not require a vow. God had stated his intentions and the fulfillment of what God promised to Jacob did not require a tithe or a promise from Jacob. 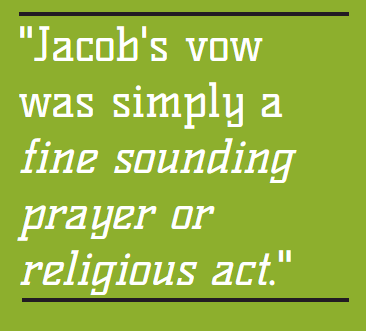 Jacob’s vow was simply a “fine sounding prayer” or “religious act”. Some believe ‘tithing’ is the right thing to do simply because it came before the law God gave to the Israelites. It certainly did but why stop there? If we want to settle this issue on the basis of time – what came first – then we have to continue to go back in time. The first time an offering to God by humans is mentioned is in Genesis 4:3-7. Cain brought some of the things he had grown from the soil as an offering to the Lord while Able brought fat portions from some of his flock. We are told that God was pleased with Abel’s offering and He was not pleased with Cain’s offering. God said to Cain in verse 7 “…If you do what is right, will you not be accepted?” For sure both Cain and Able knew what they were supposed to do and that was to sacrifice the fat of firstborn animals to God. So I maintain that if we want to settle this issue on the basis of what came first then we’re back to sacrificing animals. I just don’t believe that’s what God is looking for from us right now. I believe that what he wants from us now is clearly outlined in many New Covenant verses that I teach about in New Covenant Giving.